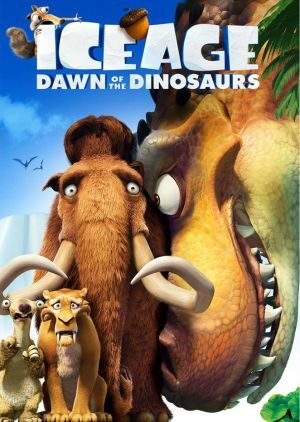 I liked Ice Age 3: Dawn of the Dinosaurs a lot more than the second movie, Ice Age: The Meltdown. In fact, I barely remember the second film. The original was great, of course, and I found this latest offering to be another fun adventure tale more in line with the original. In the sequel, Manny the Mammoth meets and eventually falls in love with a female mammoth named Ellie, so in this third film we find the couple happily together and preparing to have a baby. Like any good dad, Manny is eager and excited about the upcoming addition to their family, so he sets up a play area and tries to baby-proof by putting snowballs on pointy branches and other such silly stuff. This made both my wife and I laugh. Manny's friends, Sid and Diego, also return for this third installment. Diego, a sabertooth tiger, begins to notice that he's getting out of shape and losing that spark inside him that he used to have when he was a fierce hunter, while Sid feels left out and stumbles about a nest of three eggs that appears to have been abandon. Now here's where the actual story begins to pick up. Those eggs hatch, and turn out to be Tyrannosaurus Rex babies. Sid decides to raise them, but they turn out to be a lot more of a handful than he expected when they start terrorizing the other kids and totally destroy Manny's nursery area. This whole scene was just hilarious, with the baby T-Rexes actually eating some of the other kids! Anyway, big momma eventually shows up to take her kids back, and winds up taking Sid with her, so the rest of the gang goes off after them to rescue Sid. Now the film splits into two stories, the one where everyone treks through this new, unexplored Jungle area attempting to rescue Sid, and the one where Sid mingles with the T-Rexes, eventually working his way into their family dynamic. The adventure portion takes up most of the story, both scenarios provide laughs as well as other emotional states. There are various tense or awkward situations that change things up and make it feel multi-dimensional, so we care about these characters. Besides the T-Rex, another new character introduced here is Buck, who has been living in Jungle for many years and reminded me a lot of Crocodile Dundee, except he was also kind of crazy, which often made scenes funnier. Now, the adventure truly feels like an adventure, as they travel through all sorts of areas, such as snow, jungle, caves, rocky terrain, and even a lava area. Oh yeah, and I totally forgot to mention that Scrat is back as well. He's that squirrel-like creature that's always going after the acron-nut thing. His scenes are separate from the main plot, but are still funny and enjoyable, and in this film he actually gets to fall in love. We got the 2-disc DVD set, and the first disc contains only the movie with optional commentary and some Puppy Chow advertisement with that dog Marley from the movie Marley and Me. There are trailers as well, but I hardly consider those worth mentioning. The second disc is where you'll find all the extra features, and there are a bunch. If you pop the disc in your computer, you'll be greeted with a screen offering a choice between three games, Bubble Trouble, Scrat Pinball, and The Egg Shell Game. These are quick little Flash-based games with not much too them, but they can still be addicting. This is a good film with a lot of extra features, so definitely worth checking out in my book.